Feast of Winter Veil is just around the corner! We're kicking off celebrations early with two festive battle pets, but it's a bit tough coaxing them away from their holiday duties during the off-season. This month we're covering the Father Winter's Helper and Winter's Little Helper. Father Winter's Helper and Winter's Little Helper are two battle pets that have a chance to drop from the Gaily Wrapped Present during the Feast of Winter Veil in-game event. Players can find this lootable gift under the holiday tree in Ironforge and Orgrimmar on Christmas day (and not a day earlier than December 25th). The present can drop a number of other holiday-themed battle pets as well. These two pets are Bind On Use and cageable, so if you're unlucky with the present under the tree, you may be able to trade/buy the Winter Helpers instead. Be sure to have a Flawless Battlestone ready for these two companions; their base quality is only Uncommon (green). The Winter Helpers are pretty stubborn (and very vocal about it!) and will not stay summoned for long outside of the Winter Veil holiday — something about being too preoccupied preparing for the gifting season. Despite their busy schedules, they manage to have enough time to join your Pet Battling encounters any time of the year should you wish them to. Go figure. Once the in-game event is active they'll gladly accompany you on your wintry adventures for as long as you'll have them, and will even mount up on their own little reindeer. 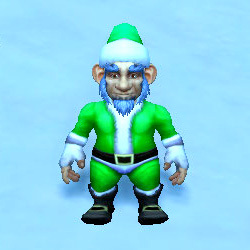 What better way to celebrate Feast of Winter Veil than to have a Winter Helper at your side? With how busy they are during the rest of the year, the holiday season is really your only chance to fully enjoy their company! The Father Winter's Helper and Winter's Little Helper are identical when battling. Both only have the B/B breed to worry about, and all their base stats are the same. They also have identical movesets. They have one real straightforward move with Elemental damage Snowball in the first slot. Most of their moves are Elemental, with the Magic move Gift of Winter's Veil as the outlier. It's a big nuke, but with a long cool down, so it has to be used judiciously. As with most good Winter Veil elves, a lot of their best stuff works around the cold. They use the weather effect Call Blizzard to apply a chill effect to their opponent for major Ice Lance damage. Unfortunately if your opponent is an Elemental or has a weather effect of their own to trade, this combo is easily neutralized. My personal favorite of all the moves the Helpers have is Ice Tomb. It can be a bit tricky to use, but after a few turns it deals big damage and stuns your opponent. It's fairly telegraphed so it can be dodged easily by your opponent if they have any dodging or debuff removal tools. The final move in the set the helpers have is one such removal tool. In addition to being a great little seasonal pick-me-up, Eggnog removes all buffs and debuffs from the user on a 2 round cooldown. These pets are great for Family Familiar challenges due to their off-family moves. They don't have much healing or sustain though, so use them primarily for burst, or just to fill out a team. They are quite charming, after all. @Dwamli: The Rotten Little Helper has a different moveset and breed than both of the "original" Winter Helpers companions. It deserves its own 'Pet of the Month' feature, and perhaps in the future we'll do just that!